Over the past several years, Hollywood has touched upon many different genres, presenting hundreds of feature films with a wide range of fields of interests. Some make us laugh, some make us cry, some even make us scared, but what about the ones that make us turn towards our religious faith (most notably with Christian based films). Of late, there’s been spurts of these types movies, including the biblical ones like Noah, Risen, and The Young Messiah to more contemporary motion pictures like Miracles from Heaven, Heaven is for Real, and God’s Nod Dead (and its 2016 sequel). Now Summit Entertainment and director Stuart Hazeldine present the film The Shack, based on the popular book by William P. Young. Does this latest Christian film finds its message of faith or is its religious overtones too heavy-handed? Suffering an abusive childhood at the hands of his drunken father, Mackenzie (“Mack”) Phillips (Sam Worthington), grows into a loving father with his wife, Nan (Radha Mitchell), and their three children, Kate (Megan Charpentier), Josh (Gage Munroe), and their youngest daughter Missy (Amelie Eve). Unfortunately, Mack’s blissful life is unexpectedly shattered when Missy mysterious disappears during a family camping trip. The police search far and wide for the little girl, but ultimately determine that Missy is the victim of a local serial killer after finder torn dress and blood in an abandoned cabin. Struggling with grief, Mack’s faith is torn asunder as is his home life with his family, with each one feeling disconnected to him. One day, Mack receives a mysterious letter signed by “Papa” (which is Missy’s name for God), inviting him to return to the cabin as she will be waiting there for him. After wrestling with the decision, Mack reluctantly elects to go, traveling back to the cabin and is overcome with rage, anger, and suicidal thoughts. 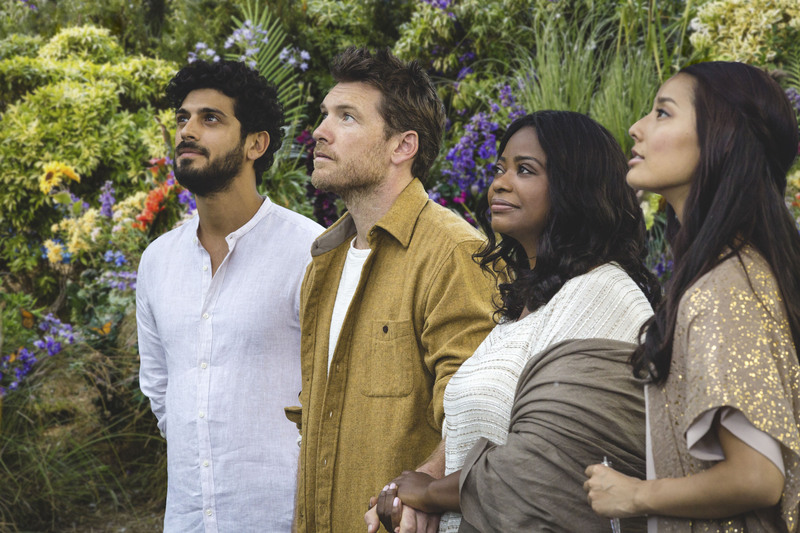 What Mack doesn’t expect is his chance meeting of three mysterious strangers…Papa (Octavia Spencer), Jesus (Avraham Aviv Alush), and Sarayu (Sumire Matsubara), who invite the wayward man to stay with them for the weekend and offer the assistance to help him restore his faith (to understand, heal, and forgive). While I have been raised to be a Christian (and I’ve been good one at that), Christian-based movies have never been my personal liking. Of course, I like the big old Hollywood epics like Cecil B. Demille’s The Ten Commandments or William Wyler’s Ben-Hur (not the 2016 version), but mostly of the recent ones of late are just mediocre in nature, trying either to be to blockbuster-ish in storytelling (i.e. Noah and Exodus: Gods & Kings) or sometimes too preachy in religious overtones (i.e. Risen or God’s Not Dead 2) that it just fails to ignite excitement or thought-provoking thoughts about the celestial heaven above. Working at a bookstore, I’ve seen many people (“Customers”) come in and buy copies of the William Young’s book The Shack (it’s even become a bestselling book). However, I never read the book, but I’ve heard good things from it. Then I remember seeing the trailer for the upcoming film adaptation and was somewhat intrigued by it, especially from several of the movie’s cast members being attached to the film project. Thus, I decided to purchase a movie ticket to go see it (the same night I went to go see Logan. Yeah, those are two completely different movies to see back-to-back). Well, what did I think of this movie. Well, I actually liked it a bit more than other Christian-based films out there, finding The Shack, despite being a bit heavy-handed at times, to be a compelling religious drama that’s worth checking out. The Shack is directed by Stuart Hazeldine, who’s previous work includes the film Exam as well as the short film titled Christian. Film-wise, Hazeldine presents The Shack nicely and crafted well enough to be in a favorable light. Translating Young’s bestselling novel is screenwriters John Fusco, Andrew Lanham, and Destin Daniel Cretton, who create a very straight-forward narrative that’s (giving the film’s subject matter and message of restoring faith and finding forgiveness in grief) both interesting and somewhat dramatically compelling. Personally, the film is a bit above the rest (the rest meaning similar religious based movies) as I found myself a bit more intrigued with The Shack than previous Christian films. For most part, the film is (on a technical level) well-made, meeting the industry standards on editing, camera angles, and production design (So I can’t complain about any of that). Additionally, while the film’s score (composed by Aaron Zigman is good (in terms of the standard score for a movie), The Shack offers two featured song, including Country performers Dan + Shay singing their song “When I Pray for You” as well as the end credit’s song “Keep Your Eyes on Me” by Country star duo Tim McGraw and Faith Hill. Both songs are pleasant and are actually quite good, fitting nicely into the feature without feeling annoying or out of place. Of course, The Shack does have its fair share of problems that, despite its lofty religious intentions and underling thematic message, fails to capture theatrical excitement and dramatic resonation. For starters, the film can’t escape being a tad hokey and cheesy, which is somewhat commonplace for these types of movies. Though it’s not as bad as some I’ve seeing of late (i.e. Gods Nod Dead 2 or Heaven is for Real), The Shack definitely feels like a film that’s meant for the small screen (a TV movie on Lifetime or ABC Family) rather than the big screen. Certain dialogue scenes are heavy-handed and are a bit forced in its presentation (not so much in their deliver of the cast, but rather in the film’s screenplay). In addition, like most Christian-based films, The Shack doesn’t stray away from following the formulaic path that similar religious movies tread down, which makes the overall film banal and lack excitement. Thus, while the film tries to be serious and prolithic in its storytelling, a viewer (myself included) can’t help but feel can’t escape being a bit silly (at times) and predictable banal. Next, the film is long and I do mean way too long, finding The Shack clocking in around two hours and twelve minutes from start to finish. While the first act, which is probably the most compelling piece of the picture, the movie’s second act definitely drags, seeing Mackenzie spending one-on-one time with each of the heavenly embodiments of God. Where the movie painfully drags the most is when Mack visits Sophia, the personification of God’s Wisdom, who is played by actress Alicia Braga, which seems to go on forever and becomes boring, which is kind of strange as the point in the film is supposed to be a very poignant scene. Finally, the film’s visual effects are a bit mediocre. Now I’m not expecting this movie, a film that has a production budget of $20 million, to rival a summer blockbuster feature, but the few moments that they are utilized are dated in comparison to even industry standard of today (even in your basic average film). The cast in The Shack is somewhat recognizable (with several familiar faces) as the performances by them are fairly good, but nothing standout nor the best roles in any of their careers. Avatar actor Sam Worthington leads the charge as the film’s lead protagonist character Mackenzie Phillips and does do a good job in the role. Worthington is definitely a sort of leading man that fits this role of Mackenzie and actually gets to show his dramatic acting chops in The Shack (i.e. displaying moments of sensitivity and sincerity), which is something I haven’t seen him do in his previous movies. Actress Radha Mitchell, known for her roles in Man on Fire and Finding Neverland, plays Mack’s wife Nan and does a fairly good job, despite the fact that there’s not much to her character. The same goes for the Phillip’s children, played by young adult actors Megan Charpentier, Gage Munroe, and Amelia Eve. All three kid actors do okay jobs in the role, but there’s really nothing memorable or remarkable about their roles as Kate, Josh, or Missy. Thus, their performances suffice for what the movie needs and it works. Additionally, country star musician / actor Tim McGraw plays Willie, a neighbor and local friend to Mack’s family, who also plays as the film’s narrator. Lastly, the movie depicts Mack’s trio of strangers, who he meets and help guide him through his grief and try to restore his faith, as the Holy Trinity of God (i.e. The Father, The Son, and the Holy Spirit). These are played by Oscar-award winner Octavia Spencer as The Father (aka Elousia or Papa), Avraham Aviv Alush, The Son (aka Jesus), and Sumire Matsubara as The Holy Spirit (aka Sarayu). While each one delivers fine performance in their particular roles (man…. Octavia Spencer is everywhere these days…and that’s a good thing), both the book and film of The Shack has fallen under heavy scrutiny with some of these depictions, quoting scriptures from the bible. Although I point this out, it personally didn’t bother me to see these three aspects of God being depicted by these actors (regardless of their gender / ethnical background). I’m merely just point that out to you (my readers) as these depictions in the film have become subjected to level of controversy within some religious viewers / circles. Mackenzie Phillips redeems his faith and experiences a very spiritual journey in the movie The Shack. Director Stuart Hazeldine sophomore film that’s based on William Young’s bestselling novel deals with a palpable subject matter, testing a person’s faith on a spiritual journey as the film projects that well-enough, thanks to its source material as well as the likeability of the movie’s actors. Unfortunately, the movie can’t help but feel a bit cheesy, a bit heavy-handed in dialogue, and predictable in its narrative path, falling pretty to many religious overtones as well as being too long in its runtime. Personally, it was okay movie. It wasn’t awesomely great, but it still held my attention from start to finish. In terms of being a religious movie, it’s a bit better than most of those types of films (I assume fans of the book will probably like the final product of the feature), which is why I would say it’s definitely a rental movie (no rush to see it immediately in theaters) and an iffy-choice for everyone else. All in all, whatever you take away from the film, The Shack represents a Christian motion picture that delivers an important message, despite if you don’t like the film at all. (I.e. look at the film’s message rather than the messenger). Just like McGraw’s Willie says in the film “you’ll have to decide for yourself”, which is what I personally take away from understanding and enjoying The Shack from not just myself, but to moviegoers everywhere.